This custom collection of 12 classics includes a dozen fairy tales with timeless appeal. Embossed with your little one's name in glittering gold foil on the royal purple cover, this elegant, hardbound book is filled with famous folk tales and fables that will spark a child's imagination while teaching them invaluable life lessons as the stories unfold. This collection of 12 classics includes a dozen tales with a timeless quality that will resonate with dreamers young and old. Each story is illustrated in a variety of artistic styles and includes the child's name within each one, creating a truly unique and authentic collection of classic works of whimsy. With a foreword that provides a succinct history of the stories, this custom collection will be a treasured part of story time and looks beautiful on a bookshelf between readings before bedtime and on quiet afternoons. Made in the United Kingdom. The perfect gift for a child. It has their own name in it. What more can you ask for. Plus it is a great to read to your child. I ordered this book for my granddaughter's first birthday which was January 20, 2916. This book is a gift that will be treasured even more as years go by and is now one of her favorites. It is extremely well done, and I couldn't be more pleased. It is personal and special. The book cover is sturdy and will last a lifetime. I recommend this for any young child and/or toddler. It will become a family heirloom. One of th best and creative gifts I have ever seen. 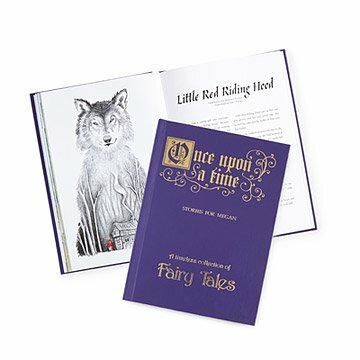 The creative and unique way of personalizing a fairy tale book for a child is amazing. I bought this for my nieces 9th Birthday and she loved it!It is a beautiful well made book that she will treasure for a lifetime! Purchased this for my friend's daughters first birthday and they loved it. Would definitely recommend as a personalized and unique gift! This gift was for our Goddaughters 1st birthday, and I wanted something special for her. Everyone at the party thought it was amazing! I bought this as a Christening gift for my niece. It's beautiful and a keepsake for sure. The personalization doesn't stop at the front cover and title page, her name is woven into the illustrations as well, which is an amazing touch I was not expecting! Love it!